Julian W. Sauls, Ph. D.
The Lower Rio Grande Valley is actually more delta than valley, situated as it is within 100 miles of the mouth of the Rio Grande River. It includes a wide range of soil types, from coastal sands to heavy clays. Over half of Hidalgo county, where nearly 85 percent of Texas citrus is located, is comprised of soils of the Hidalgo, Brennan, Willacy, Delfina, McAllen, Hargill and Racombes series. These soils are deep, well-drained, coarse sandy loams to fine sandy clay loams. As a rule, these soils are fertile and are well-suited to citrus production. Soil pH is alkaline, generally in the range of 7.6 to 8.0, although both higher and lower pH values occur. The ground water table is usually below 5 feet and soil salinity is usually manageable. There are at least 15 nutrient elements which are considered essential to citrus growth and development. Three are provided by air and water, the other 12 must be provided by the soil or by supplemental fertilization. Among the macroelements, only nitrogen must be routinely applied to Valley citrus orchards. Long term nutrition studies in Texas citrus have not demonstrated a meaningful response to supplemental applications of either phosphorous or potassium. Among the microelements, only iron and zinc deficiency symptoms have been commonly observed in the field. As a rule, iron deficiency symptoms may appear in early spring, then disappear as soil temperatures increase. The application of iron chelates has not proven to be necessary except for a few plantings of Swingle citrumelo and, to a lesser extent, the citrange rootstocks, especially on soils of high clay content. Symptoms of zinc deficiency are occasionally noted, but the symptoms are rarely extensive within an orchard or even within a tree. It is uncommon to find zinc deficiency patterns on more than a few leaves or more than a few twigs on a tree. Research into the deficiency has not resulted in increased production as a consequence of foliar zinc applications. Further research is needed, however, especially of a long-term nature. Iron deficiency of citrus. Zinc deficiency of citrus. Soil amendments are rarely used in Texas citrus orchards, probably more because of the lack of available materials than any for other reason. Results of research with soil amendments have been inconclusive except in cut areas where the existing topsoil was removed and dispersed over the rest of field during land leveling operations. In such areas, pre-plant incorporation and repeat applications of a suitable organic matter would undoubtedly be beneficial. Citrus can be successfully grown in Texas without using either soil or leaf analyses to direct the fertilization program. Indeed, following the general recommendations for nitrogen fertilization, coupled with close observation of visual symptoms of nutrient deficiency (and the correction thereof), is adequate for average production. For optimal production and quality, however, a routine program of nutrient analysis and soil salinity measurement is essential to correct potential problems before they become limiting to production. Analytical procedures used in soil testing vary considerably among labs, as do the results they obtain. None are capable of reporting available nutrient levels in a sample--they can only report the chemically extractable levels. Moreover, no soil testing extraction procedure has yet been calibrated to correlate the extractable value of any nutrient element with citrus production levels or citrus fruit quality. In other citrus-producing areas, soil testing is widely considered useful to determine soil pH, soil phosphorous, soil calcium and potentially toxic accumulations of soil copper. In our Texas citrus soils, however, alkaline pH is a given, as are more than adequate levels of soil phosphorous and soil calcium. The long-term use of copper fungicides in Texas citrus has not resulted in appreciable increases in soil copper levels. Consequently, routine soil testing in Texas citrus orchards is of limited value. That being said, however, a standard soil analysis should be conducted every couple of years or so simply to verify pH and soil levels of phosphorus, calcium and copper. Because salinity is ever-present in Texas citrus soils and irrigation waters and because high salinity dramatically reduces root growth, thereby reducing shoot growth and yield, salinity analysis is critical for optimal citrus production in Texas. The threshold salinity level, i.e., the level at which initial yield declines occur, is considered to be about 1.6 dS/m (deci-Siemens/meter or mmhos/cm), which is about 1120 ppm salts. With irrigation water of greater than 1.0 dS/m (700 ppm), which is about normal for Rio Grande River water, soil salinity can quickly increase to detrimental levels in Texas citrus orchard soils, especially in times of drought and inadequate supplies of irrigation water. Symptoms of salinity include reduced growth of roots and shoots, decreased flowering and smaller leaves--but these symptoms are not easily recognized, and they usually occur before typical toxicity symptoms appear in the leaves. 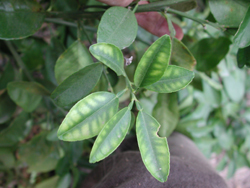 Probably the most common visible symptoms of excess salinity are chloride toxicity--tip burn and marginal necrosis of the leaves--and sodium toxicity--general bronzing of the leaves. To determine soil salinity, composite samples from several locations in the orchard should be taken in 1-foot increments to a depth of 4 feet. Each separate depth increment should be combined with other samples from the same depth to make a total of 4 composite samples for the orchard. Such sampling will indicate the effectiveness of leaching or the need for additional leaching. In orchards with drip or microsprayer irrigation systems, the samples should be taken from within the wetted zone. Leaching of salts on deep, well-drained soils is accomplished with both rainfall and irrigation. Soils with a high water table or that have internal drainage problems should be abandoned insofar as citrus production is concerned. The alternative to abandonment is the installation of an extensive sub-surface drainage system. The use of leaf analysis is based on a given range of concentrations of each nutrient element which correlates well with optimal growth, production and fruit quality--even under different soil types, climatic conditions and rootstock/scion combinations. Indeed, years of research have confirmed the correlation between leaf levels of the various nutrients and citrus productivity. Essentially, there are two schools of thought regarding the type of leaves to be sampled and the optimum concentrations of elements in the leaves. The program developed in Florida is predicated on the sampling of spring-flush leaves from non-fruiting terminals, while that in a few other areas is based on leaves from fruiting terminals. There are pros and cons to both procedures, but the Florida procedure is more widely accepted. The beauty of leaf analysis is that, properly collected, it indicates the current nutritional status of the orchard, as it measures only the nutrient levels that the trees were capable of extracting from the soil. Recorded over time, along with fertilizer inputs, leaf analysis accurately reflects prior nutritional and production practices in the orchard. Moreover, leaf analysis allows adjustments to the fertilizer program before one or more elements becomes limiting. However, to be of maximum usefulness, leaf sampling procedures must be followed precisely, or the analytical results may be invalid. The leaf sample consists of at least 100 leaves that are 4 to 6 months old, taken from non-fruiting twigs or terminals of the previous spring's growth flush. Thus, sampling should be conducted from July to September. The orchard to be represented by the leaf sample should consist of only one rootstock/scion combination of uniform-aged trees, within a single soil type. Select 15 to 20 trees randomly across the orchard from which to collect five or six leaves each. Leaves should be free of damage from insects or disease. 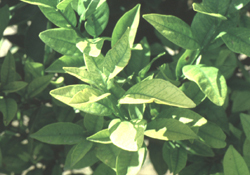 Leaves with obvious chlorosis should be excluded, unless the sample is being taken specifically to ascertain a potential nutritional cause of the chlorosis. While still fresh, the leaves should be washed to remove soil or dust, then air dried, packaged and submitted to the laboratory for analysis. When the results are obtained from the laboratory, compare them with the standards shown in Table 1. The laboratory will report the levels of major elements as percentage of dry weight, while microelements will be reported as parts per million. If the orchard has been sprayed with any nutrient element at any time since the spring flush leaves emerged, the analytical results for that element or elements should be disregarded, as an indeterminate quantity of foliarly-applied nutrients may still be present on the surface of the leaves, thereby resulting in falsely high readings. Table 1. Citrus leaf analysis standards based on nutrient concentration in 4- to 6-month-old spring-flush leaves taken from non-fruiting terminals from July to September (based on University of Florida recommendations). Ammonium sulfate is the most commonly used dry fertilizer in Texas citrus, as it is among the lowest of nitrogen materials in terms of relative salt index, and its sulfur content is useful in attenuating alkalinity. N32 or urea ammonium nitrate is perhaps the most common liquid nitrogen source. Obviously, other materials and formulations are available and are used. Because yield differences have not been correlated with different formulations, the grower's choice is usually based on the method of application, i.e. broadcast dry or injected through the irrigation system, and the price per unit of nitrogen (not the price per ton of fertilizer!). Nitrogen fertilization is commonly based on tree age, tree size or prior yields. General recommendations for citrus trees of different ages are shown in Table 2. During the first three years of orchard establishment, the recommendation is in pounds of actual nitrogen per tree, since young tree fertilization is usually accomplished by hand application. Fertilization should be split equally into several applications during the spring-to-summer months, as young trees are better able to utilize small applications frequently applied. For bearing trees, the rates are presented as pounds of nitrogen per acre per year, as applications are normally accomplished by use of mechanical spreaders which broadcast the fertilizer over the entire orchard floor. Higher applications than those shown are rarely justified in Texas citrus, and then only on the basis of leaf analysis. Table 2. General nitrogen fertilization rates for citrus in Texas. In other production areas, the amount of nitrogen to be applied is calculated on the basis of prior production. Under that scenario, the rate to be applied is 8.9 pounds of nitrogen per ton of fruit produced. Since harvest of the current crop is rarely completed before the need to apply fertilizer for the coming crop, this method to determine nitrogen rates would be better calculated on the basis of the last completed season's production, i.e., the 2003-04 crop should be fertilized on the basis of 2001-02 production. This reasoning will be further explored with relation to alternate bearing in the next section. Neither the timing of application nor the number of applications of nitrogen appear to matter as much as the consistency of applications from year to year. Most Texas growers make a single application annually, usually two or three months prior to bloom. A few growers utilize split applications, with two-thirds of the rate applied pre-bloom and the balance in May. Growers who fertilize through the irrigation system commonly make injections at least monthly through the year. Over the last several seasons, Texas citrus production has been characterized by higher levels during seasons which bloomed in even-numbered years (e.g., the 2000-01 season) followed by lower production in odd-numbered seasons (e.g., the 2001-02 season). This alternating tendency exists across the board for all varieties of citrus--grapefruit, navels, early oranges and Valencias. While some orchards do not exhibit alternation, having fairly consistent production from year to year, others that do exhibit alternation are out of phase with the industry, being up when the industry is down and being down when the industry is up. The Texas citrus grower has only two options with which to try to attenuate alternation--fertilization and pruning, with the latter being discussed in another publication. Alternate bearing persists because the tree uses almost all of the nutrients and reserves available to it to mature a large crop of fruit, with little energy being left to provide sufficient growth for the next crop. Consequently, the next crop is lighter, so the tree produces more growth than average, setting up yet another year of higher production. In order to begin to break the cycle, nitrogen fertilization rates should be increased during high-production years and deceased during years of low production. To accomplish this with a single fertilization, the grower should apply 8.9 pounds of nitrogen per ton of fruit produced in the season preceding the current one. In other words, fertilizer the 2003-04 crop based upon production in 2001-02. An alternative solution is to utilize split applications of nitrogen. Apply 2/3 of the expected annual rate pre-bloom, then assess fruit set in early May. If set is deemed to be heavy, apply the remaining balance of nitrogen plus an additional 50 percent of that. If set is light, skip the May application entirely. Annual leaf analyses may indicate the existence of alternate bearing when the same quantity of nitrogen is being applied every year. In years of higher production, leaf nitrogen levels should be a little higher because the absorbed nitrogen is concentrated in fewer leaves. Conversely, in years of lower production, leaf nitrogen levels should also be lower because the nitrogen is diluted over considerably more leaves. When bearing orchards must be severely pruned in order to topwork the trees to a different variety or to rehabilitate the trees following significant freeze damage, nitrogen fertilization rates should be reduced to levels consistent with the reduced tree size. Indeed, no fertilizer should be applied during the first season after such severe pruning, as regrowth will be more than sufficiently vigorous without it. In the second season after severe pruning, use the general rate recommended for either 4-year-old or 5-year-old trees. In the third and subsequent seasons, switch back to the normal fertilization program. Sheepnosing of grapefruit is apparently caused by climatic factors occurring at some specific but undetermined time during flower induction-differentiation-initiation and early fruit development. It has never been considered to be a common occurrence, as most grapefruit varieties may not exhibit sheepnosing more often than once every 8 to 12 years or more. Rio Red grapefruit, however, apparently has a genetic proclivity to sheepnosing, inasmuch as sheepnosed fruit can be found in every Rio Red orchard in Texas every year--only the percentage of affected fruit and the severity of the disorder differ from orchard to orchard and year to year. Neither nitrogen fertilization, overall nutrition, irrigation system, amount of irrigation nor other cultural practices cause sheepnosing, so its occurrence cannot be induced by anything the grower does or does not do in orchard management. Production inputs can, however, influence the severity of the disorder--any production practice that induces greater vigor than is necessary will increase the severity of sheepnosing, i.e., excess vigor will cause an otherwise moderately sheepnosed fruit to become severely sheepnosed. Consequently, growers must try to limit tree vigor, particularly during seasons in which the overall percentage of sheepnosed fruit is expected to be higher than normal. Current work to try to predict, in relative terms, how bad sheepnosing will be is still underway. Many growers have routinely reduced nitrogen fertilization levels for Rio Red orchards by about 25 percent. Others have opted for split applications, with the idea of eliminating the second application if it is determined that the incidence of sheepnosing is high. Such practice may or may not coincide with the need to adjust nitrogen fertilization levels to attenuate alternate bearing. If it does not, it may be preferable to concentrate first on alternate bearing and then work on the attenuation of sheepnosing. Winter-applied foliar sprays of 53 to 60 pounds per acre of low-biuret urea have increased navel orange production in California. Similar results have been reported for Valencia oranges in Florida, both from winter-applied urea and from 2.5 quarts per acre of Nutriphite applied either in winter or at the initiation of open bloom. Both products can be phytotoxic to citrus, which may be a factor in causing enhanced fruit set. Neither product has been tested under Texas conditions, nor am I aware of plans to do so. The timing of application of urea is critical to success--and such timing is not easily determined. For example, urea sprays must be applied after some natural flower induction has occurred but before most flower bud differentiation begins. In the Florida work, the critical period for application occurred in late December in some years, early January in others. Because the critical window for the application of urea is likely to be different each year, we have to develop a means to determine that window before we can test urea sprays and expect meaningful results. In the Florida work, Nutriphite was applied either at the same time as urea or, alternatively, at 5 to 10 percent open bloom. The latter application timing is one which we can use in coming seasons to test Nutriphite under Texas conditions. Yield increases averaged 13 to 17 percent over the four years of the test. Although micronutrient sprays are sometimes routinely included in post-bloom or later pest management sprays, there is no supporting research for this practice. The inclusion of any micronutrient in the spray program should be based on low or deficient levels as determined by annual leaf analyses. While some growers might argue that the presence of visual sypmptoms of deficiency should be sufficient, the fact is that growth and productivity may have already been affected by the time visual symptoms of deficiency appear. Most growers who have drip or microsprayer irrigation systems are using them for nitrogen fertilization, typically injecting liquid nitrogen at least monthly. Injection should occur near the end of the irrigation cycle, as earlier injection could push the fertilizer lower in the root zone and soil profile than is desirable. Following injection, the system should be run long enough to clear the fertilizer solution out of the lines. Because of the greater efficiency of fertilizer application and utilization via fertigation, nitrogen rates should be reduced to about 80 percent of the level which would be broadcast as dry material. Too, it doesn't happen often, but rains can occasionally occur with such frequency that the irrigation system may not be used for several weeks--without irrigation, there is no fertilization. Consequently, some growers broadcast about one-third to one-half of the annual nitrogen requirement during the months pre-bloom--and then only in alternate middles. As a final note, growers should understand that while nutrition inputs in the current season may impact the quality of the current crop (e.g., sheepnosing in Rio Red) as well as overall set and fruit size, the applied nutrients must also be sufficient to provide the optimal vegetative growth which will be needed to produce next season's crop.